YardEdge talks to Jamaican watercolour artist Juliet Thorburn about her work and what it’s like to be a full time artist in Jamaica. Juliet: It’s a creative outlet for me- a part of my self expression. YardEdge: When did you first become an artist? Juliet: From around the age of four I felt that art was very important to me and that’s what I wanted to do. It felt right to me. 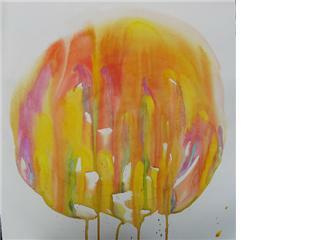 Juliet: I have several different styles going on – I paint water colours in both a representational way and abstractly. The representational pieces are quite colourful and have a soft, magical quality to them. 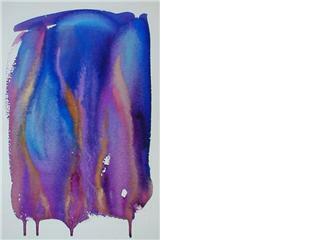 The water colour abstract pieces, the Ethereals are more about the feeling in the moment. I use the other medium of oil in a more personal and symbolic way, which sometimes incorporates a whimsical and spiritual approach. Juliet: Georgia O’Keefe, Vincent Van Gogh and perhaps Paul Gauguin are the artists that have influenced me the most. Also Jean Michel Folon and my grandmother Barbara Parsons with water colours. Georgia O’Keefe with her floral close ups and also her perspective and New Mexico landscapes. Van Gogh with his colour, energy and movement – his spirit. Paul Gauguin with his colours and approach. Folon with his use of water colour and his washes. My grandmother with her love of nature. Other additions are Graham Davis and Colin Garland. Graham for his approach, beauty and softness and Garland for his fantasy and surrealism. Juliet: Spanish and Italian languages, dancing, music, tarot reading, walking, meditation and Hatha yoga, swimming, spirituality, human evolution and growth, metaphysics…. YardEdge: What inspires you to create art and how do you keep motivated when things get tough? 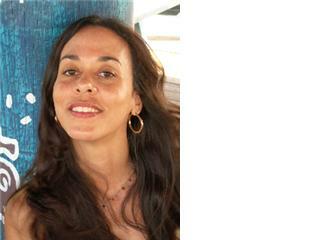 Juliet: Nature, stillness, self-exploration and understanding all help to inspire me to create. When the creative juices are not flowing then I try to retreat or focus on other things. This is however easier said than done by far. Juliet: I have had to handle the business side by myself for the most part, often by trial and error. Trying to incorporate this along with my art, sometimes getting suggestions from others and some support and finding ways to make the time for it. YardEdge: What’s the best and worst parts of being a full time, working artist? Juliet: The best part is being independent and doing what I want with my time and energy. The worst part is the uncertainty that comes along with it and also trying to manage everything more or less. YardEdge: Has your style changed at all through the years? If so, how? Juliet: Yes, it had changed quite a bit in regards to taking on a new medium (oils) in the last three years. My style in this respect has become more minimal and personal and expressionistic and the colours even bolder and more vivid due to the nature of the paint. YardEdge: How did you find doing illustrations? Juliet: Doing illustrative work is more commercial for me and therefore can be a bit more limited. However I do enjoy it to some extent as I often get to create subjects that I normally wouldn’t. It therefore has assisted me in stretching myself. YardEdge: How long does it take you to do one of your paintings? Juliet: It varies, depending on the painting. It can be anywhere from let’s say thirty minutes to two weeks. However on average I would say about four to five days. Our talented creative people in the arts are neccessary to the quality life, since they bring to us perspectives which the madding life many of us live preclude us from achieving such nice,fine, and glorious observations. In this respect Juliet is a national treasure and I am inspired by all of her output in watercolour and am looking forward to her expressions in oil. Right on Jaythor!!! Our talented creative people in the arts are neccessary to the quality life, since they bring to us perspectives which the madding life many of us live preclude us from achieving such nice,fine, and glorious . In this respect Juliet is a national treasure and I am inspired by all of her output in watercolour and am looking forward to her expressions in oil. Right on Jaythor!!! Juliet, all your friends have adequately described the wonderful person that I know. I don’t normally post comments on websites, but thought you might be interested to discover that “I” too, am so happy about this amazing journey you’re on – and that (far too infrequently) – our paths cross along the way. I have three daughters who represent the mind, the body and the spirit. Juliet is the spirit! Really! One of her friends said “JUliet does not have a mean bone in her body!” It is True. I love her work and along with my mother’s,I have it all over the house. I have the range of her work from the earliest stage to now, though I dont have any oils yet–not for long! It is very hard to make a living as an artist in Jamaica but I hope she eventually achieves that goal. Delighted to see you are expanding your territories! Lovely to read an interview with one of my fave people, and particularly about your influences and growth as an artist. I haven’t seen any of your oils as yet, and I’m keenly interested. Looking forward to Part 2 of the interview. Peace, luv.